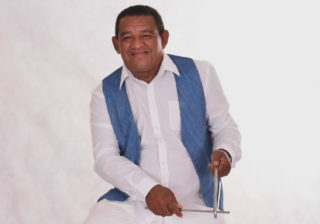 Antonio Barbosa do Nascimento, born in Belém – PA on 11/01/1960, known artistically as Mestre Marrom, began his career at the age of 12, singing to the side of Joca do Acordeon and Zé da Ema, two exponents of Northeastern culture. In the 1990s he was invited to integrate ‘Os 3 do Nordeste’. In the trio, he took on the defending the vocal, having Mestre Zinho as his great inspiration. Your first recording was in 1993, with the song ‘Vem Moreninha’, written by Parafuso and Zé Pacheco. Stayed in the trio until 1996, having recorded 5 LPs. After his success with ‘Os 3 do Nordeste’, he sought new challenges singing with the trio ‘Os Filhos do Forró ‘, in which he recorded 2 CDs. He then began his solo career. Today, with more than 30 years of career and 14 recorded CDs, is known throughout Brazil, mainly in the northeast, thanks to his presence on stage, his remarkable voice and his charisma.